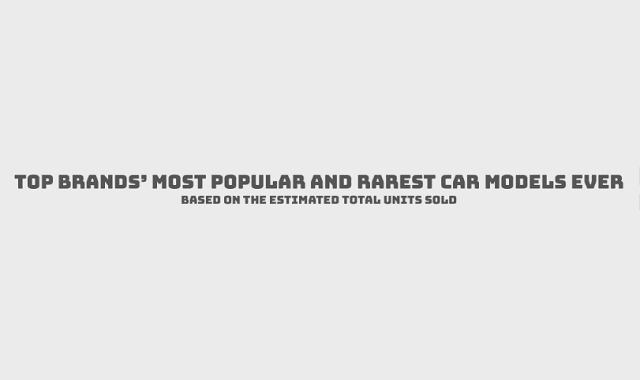 Top Brands' Most Popular And Rarest Car Models Ever #Infographic ~ Visualistan '+g+"
What are the rarest and most popular car models that each of our favorite car companies have churned out? Is your car one in a million or one of a few? From the super-popular Toyota Corolla, which has been made steadily since 1966, to the super-rare Rolls-Royce V-8, of which only three were made in 1905, these are the most popular cars in the world organized by make, along with each company’s rarest side project. Are the rarest cars in the world also the best? We’re not sure, but they’re usually more expensive, with the latest auction prices ranging in the millions. Popular cars like the Volkswagen Golf (of which 30 million were made) stay cheap, but they’re usually loved for a reason. Check out these top car companies’ rarest and most popular cars to date!